Bleacher Report named Rams OLB Connor Barwin one of the ten most overlooked additions of 2017. The 30-year-old Barwin signed a one-year deal with the Rams earlier this offseason. Barwin earned an overall PFF grade of just 42.1 in 2016, ranking 100th out of 109 edge defenders. 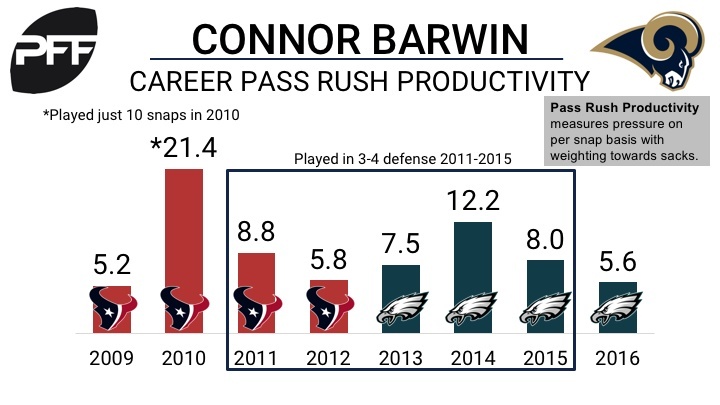 After reaching an apparent peak in 2014 (grade of 78.5), Barwin has seen his grade decline each of the last two seasons. In his best season in 2014, Barwin finished with a pass rush productivity mark of 12.2, ranking sixth out of 43 3-4 OLBs (minimum 150 pass rush snaps) and he notched 56 total pressures over the season.